Brief Synopsis: "No drinking. No smoking. No cursing. No dancing. No R-rated movies. Kevin Roose wasn't used to rules like these. As a sophomore at Brown University, he spent his days drinking fair-trade coffee, singing in an a cappella group, and fitting right in with Brown's free-spirited, ultra-liberal student body. But when Roose leaves his Ivy League confines to spend a semester at Liberty University, a conservative Baptist school in Lynchburg, Virginia, obedience is no longer optional." The storyline is simple: regular guy (ie. secular) goes to a strict religious school. The author Kevin Roose is indeed a young guy, and the way he writes the book makes it an enjoyable read although his language gets a bit crude at times. He also tends to characterize people by describing someone as a celebrity. (Jamie Lee Curtis for example. What does that mean exactly? Is she still considered hot? Forty years from now one would REALLY wonder what Kevin is driving at.) There are certain opinions he expresses that others may not agree with which may make this a harder read for them. I chose to ignore some of those types of things so I could get to the bigger picture. Truthfully, I learned a lot from Kevin's book because I am also a 'regular' girl. I grew up going to Catholic Church on Sundays, I even taught a little after-school religion myself before I moved out of NY. But honestly, that's as far as I got. This is a great look at how the 'other half' lives. The book does not set out to convert anyone, it is just a view on the college he attended for that semester and how it affected him. (Kevin himself returns to Brown the next semester). Even so, it has inspired me to have more of a spiritual opening for God. I empathized with Kevin while he tried to fit into the mold of the college, but I also understood the viewpoints of the students at Liberty University. 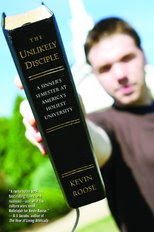 Everything from joining the choir, learning the coursework for his classes, the mindset of the students and Kevin's personal beliefs are laid out in this book like a mini-memoir. Kevin explains the beliefs of the religion while writing of the reasonings behind them and why it clashes with what he has been brought up to believe, such as Creationism vs. Darwinism. Certain things like Global Warming does not exist, homophobia and all the things on the 46 page code of conduct at Liberty were all very interesting. We learn some of the background of Jerry Falwell, Liberty's founder, and sit in on some of his lectures. (Sermons?) It is a very thorough book detailing the day to day activities of Kevin during his time at Liberty. After reading this book, I wouldn't mind sending my kids to Liberty University, but just for a semester. The rules are strict as far as morals go and that's always a good thing in my book. For Kevin's writing endeavor I give him a 3.5, it was well written for a beginner. A very good topic though, and has already won lots of rave reviews. An interesting detail about how he actually has to take notes on his experiences is that he has to duck into bathrooms for privacy. His classmates thought he had a bladder problem! Kevin has more information "Behind The Book" on his site, and read an excerpt here from Hachette. I was very interested in learning how his classmates felt once they realized that "their friend Kevin" was actually there to just be a journalist. Or you can enter to Win the Giveaway courtesy of Hachette! You do not need to leave separate comments, all in one comment is fine. I will use Randomizer to select the winners. You must be 18 years of age or older to enter. The giveaway is open to Canadian and US residents only. NO P.O. Boxes. One winner per household/IP address. I will email the winners and they must respond within 72 hours. This giveaway will end on Saturday April 25th Midnight E.S.T.